Do you eat a lot of French cuisine? I don’t. Maybe that’s because it’s not as accessible as some other more popular cuisines, meaning not as many chefs are doing it. More likely, there aren’t a ton of chefs doing it really well combined with most of the French food items I enjoy are big hearty dinner-type dishes that are succulent and meant to be enjoyed at a casual pace in an intimate environment. I have a baby so that’s just not how we dine. That aside, had an outstanding French meal made with care, attention to detail based on classic French protein dishes Dominique Bistro by Dominick Pepe. 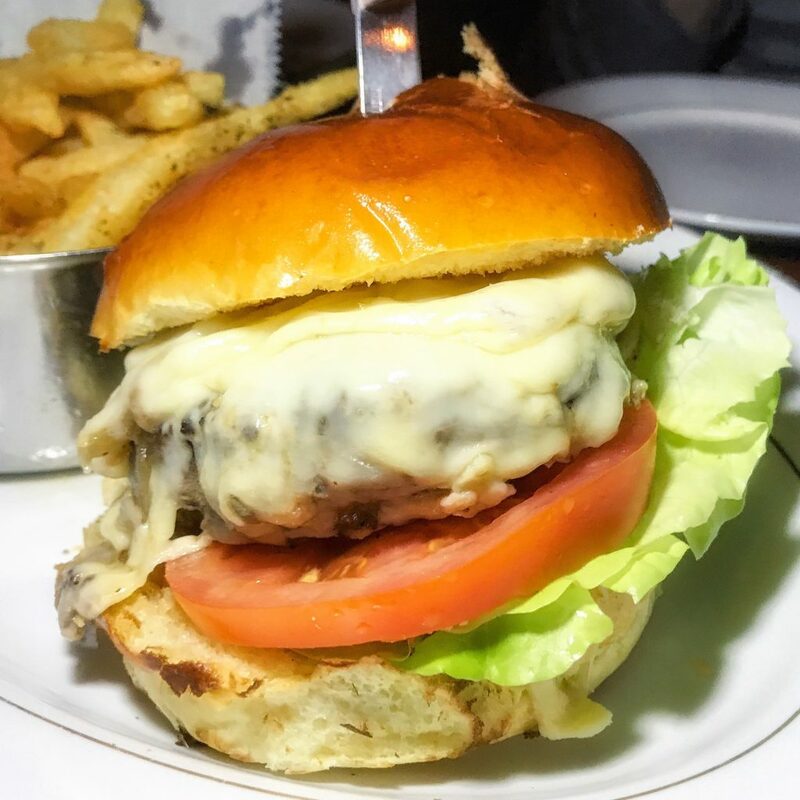 This is their Bistro Burger, a short rib blend, topped with gruyere (one of my fave cheeses for a Burger), caramelized onions, lettuce and tomato. You have to love onions to appreciate this Burger, which I most certainly do. The flavor is reminiscent of French Onion soup over a juicy piece of beef. If that’s your jam, go eat this Burg. 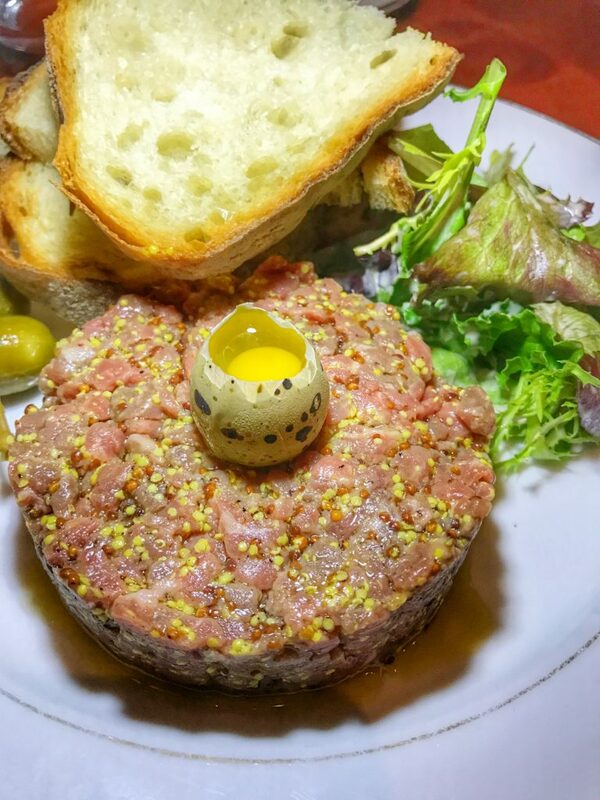 Steak Tartare – beef tenderloin, quail egg, gem salad & caper berries. If you think that looks good, wait until you try it. There was not a single bite left on our plate. This dish is all about a dance of delicate flavors intertwining. 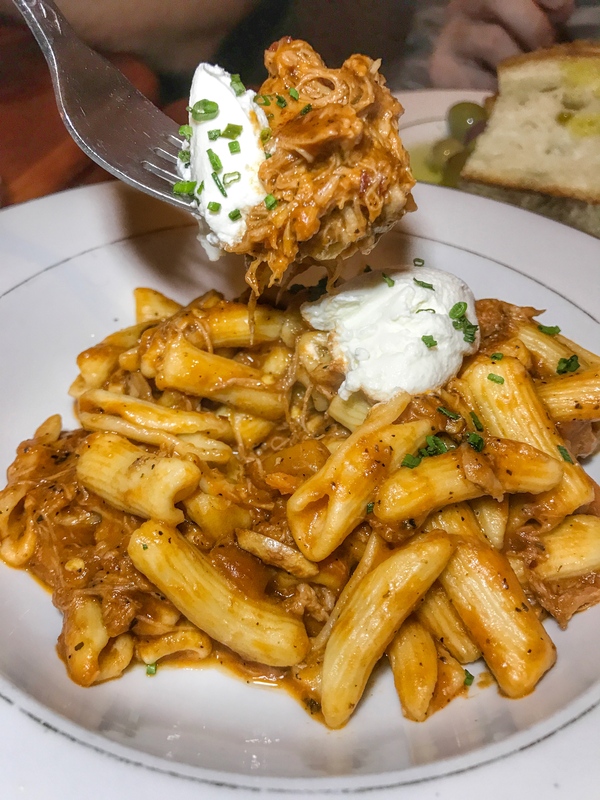 Cavatelli – rabbit ragout, golden raisins, marcona almonds, ricotta. On the other hand, this robust pasta dish is found in the “les pâtes” portion of the menu. Rightfully so, that means “pasta.” Our server considered this an appetizer to split. Are you starting to love this place? 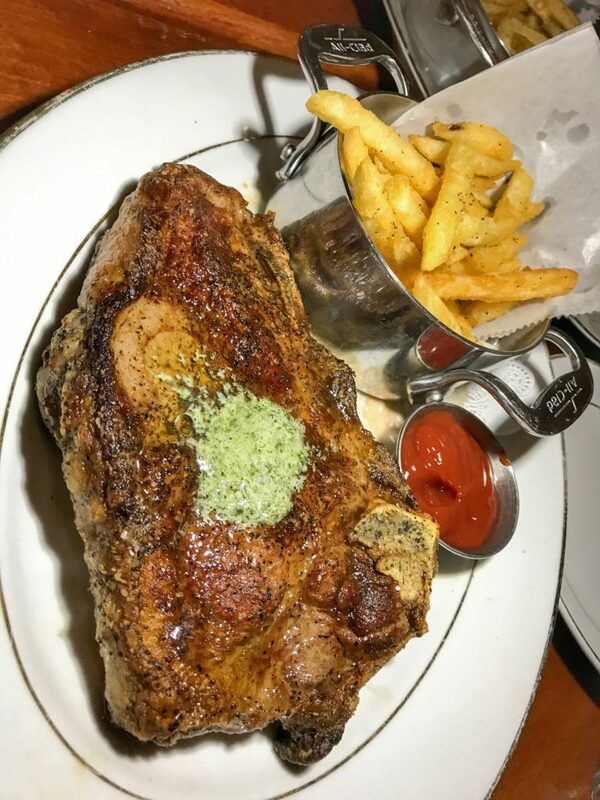 Steak Frites – 14 oz bone in NY strip, french fries & tarragon butter. I’ve had a lot of steak frites in my life. Typically you get a rump steak or a ribeye, both of which are very delicious. Seldomly is the dish offered with a NY strip, let alone one that’s bone in. The flavors in this will make your head pop off your body! The 3 of us who split the meal sliced this down to the bone, which I almost took home to make soup with. Ill say this, save room for the frites because they were perfectly crispy, juicy and savory, almost to a point of being buttery. In fact, no matter what you order, get those fries!!! You need to eat here. I can’t wait to go back. This entry was posted in Burgers, French Fries, Steak and tagged cavatelli, Cheeseburger, dominick pepe, Dominique Bistro, french food, nyc, rabbit ragout, steak frites, steak tartare. Bookmark the permalink.